This is the mysterious ancient city found on a remote island in the middle of the ocean – and experts believe it’s haunted . 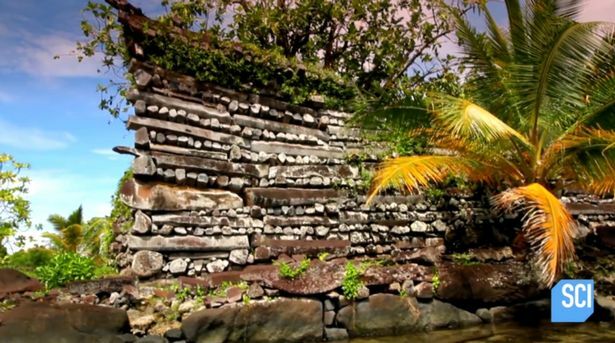 Archaeologists have taken a look inside the virtually uninhabitable Nan Madol, which is just off the main island of Ponhpei in Micronesia in the Pacific. The strange city, which was dubbed the Eight Wonder of the World by early European explorers, was discussed in the Science Channel series ‘What on Earth?’. It was previously impossible to get there due to its incredibly remote location and is being compared to the lost island of Atlantis, which is rumoured to have disappeared under the sea. Researchers believe it could date back to the first or second century, but no records which could prove this exsist. There are 97 individual blocks, which are geometrically shaped, and separated by narrow channels of water – but the reason why is not entirely clear. The city is 1,600 miles from Australia and 2,500 miles from Los Angeles. The name Nam Madol means the ‘space in between’, something which has baffled researchers. Some people have dubbed it the “ghost city” and natives of Pohnpei refuse to go near it, claiming the city is haunted. But the few willing to take tourists there will only do so in the daylight, with locals claiming to have seen mysterious, glowing orbs around the site at night. They have nicknamed it the City of Ghosts and believe if they stay there overnight, they will die. The island served as a burial site for chiefs who lived there and was the seat of political power, the centre of the most important religious rituals. Pohnpei is located just off the coast of the country of Micronesia, a tiny country made up of small tropical islands.